Hi everyone! 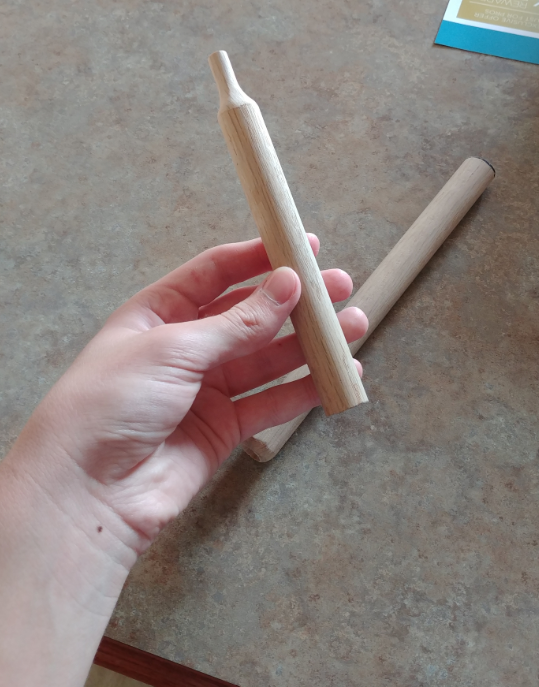 I would like to share with you all my new homemade gerb tools. The tools took around 7 hours to make. 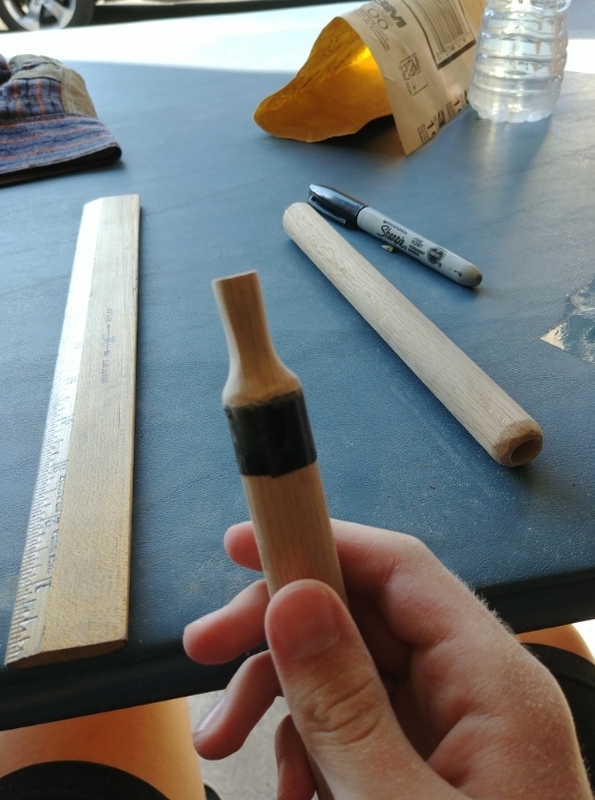 (with breaks to eat) I do not currently have access to fancy machining equipment like a lathe or drill press and can't scrounge up the money to buy tools so I figured I could make my own. The tools are built for 3/4" ID tubes. I know that the nozzle is rather large, (it's 3/8"!) but I made it that way intentionally because I have been having many centering issues with smaller nozzle sizes using my hand drill. I started by sawing off a 7" long piece of a 3/4" dowel I got from Home Depot. Next, I sanded down the rough edges. 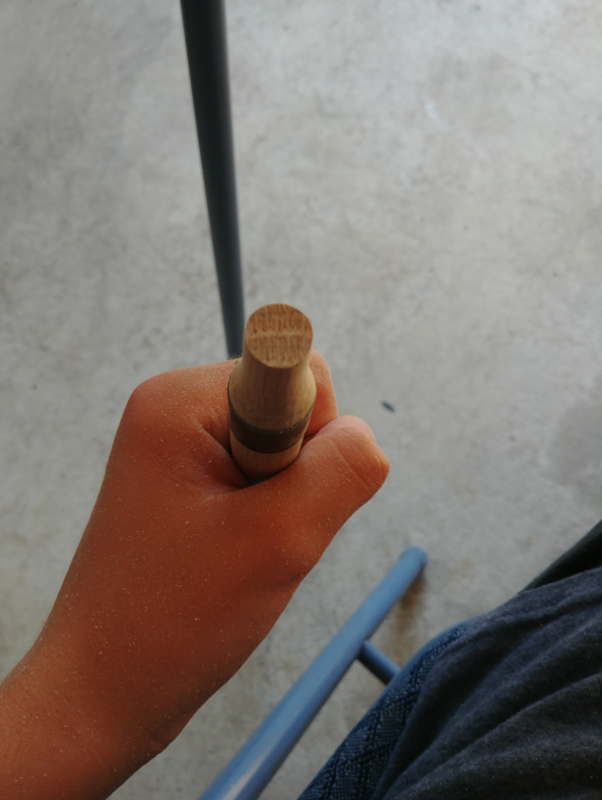 After the initial sanding, I began sanding one side of the dowel, creating beveled edges. This piece would be my long rammer. After beveling it, I carefully and slowly drilled into the center of the dowel using my hand drill and a 3/8" bit. Getting deeper into the hole. It was becoming harder and harder to keep the drill straight. 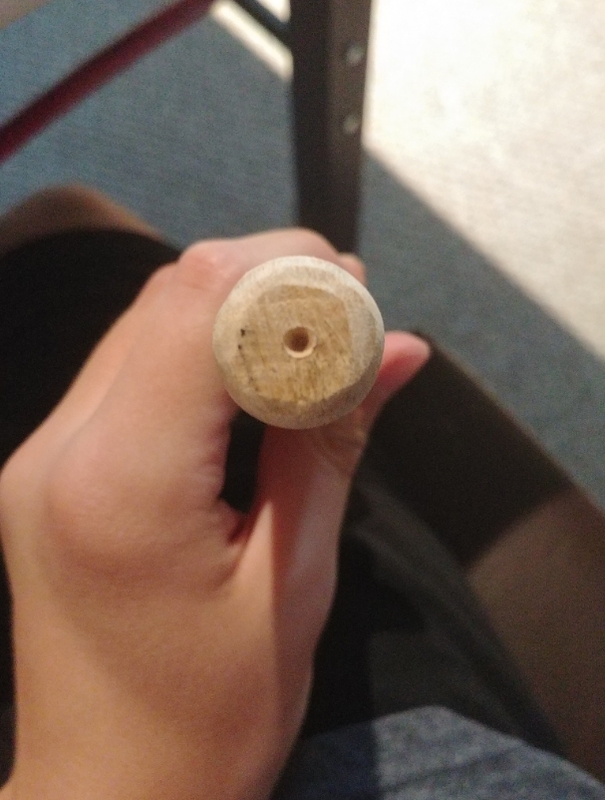 This took me a long time because I had to make sure the hole was straight and centered at all times. Once my rammer was finished being drilled, it was complete. For my solid rammers, (which I did not take photos of) I just sawed off lengths of my 3/4" dowel. At this point, I just had to make a spindle. 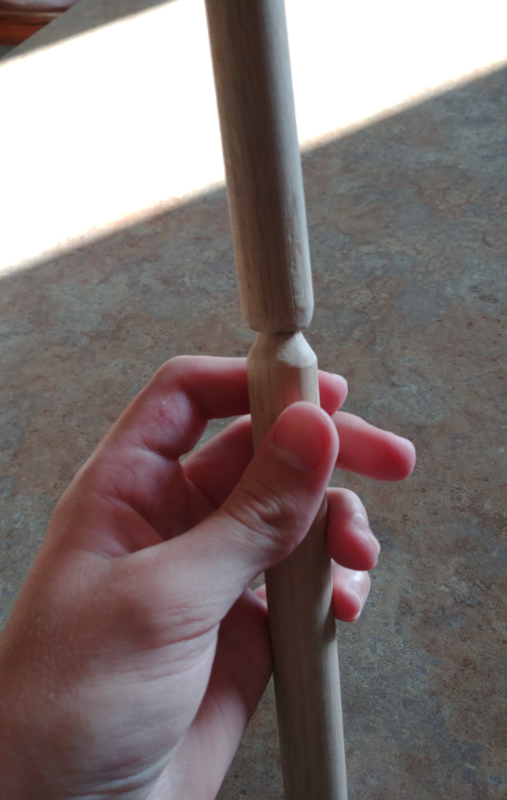 I had many different ideas for the spindle involving holding bolts into a 2x4 with nuts, finding something at Home Depot which resembled a spindle and was 3/4" in diameter, and many other ideas. I wanted to conserve as much money as possible so I tried an idea which I would not recommend at all. 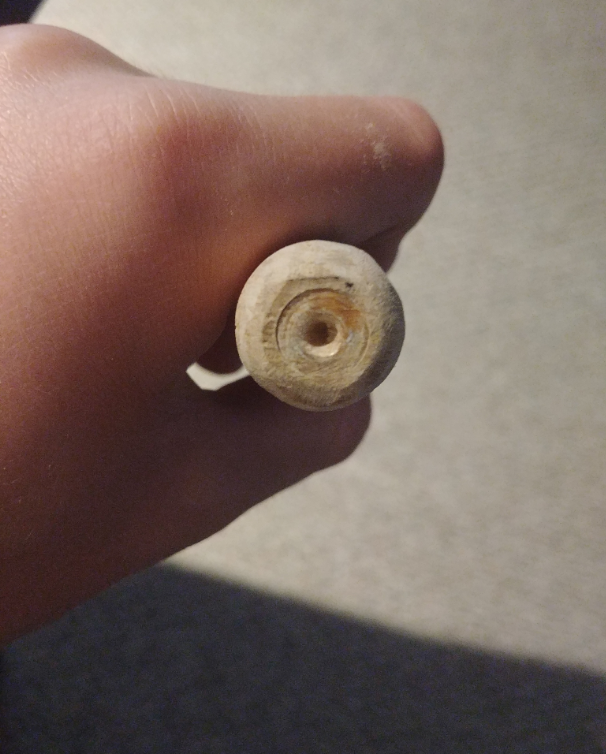 My idea was to just sand down part of my dowel until it was 3/8" in diameter. I knew this near impossible to do by hand so I used a sandpaper attachment for my dremel and started sanding. I placed a piece of electrical tape where I wanted my thin spindle area to end. As I continued to sand down the dowel, my hands were getting very tired and the sandpaper attachment was getting destroyed. 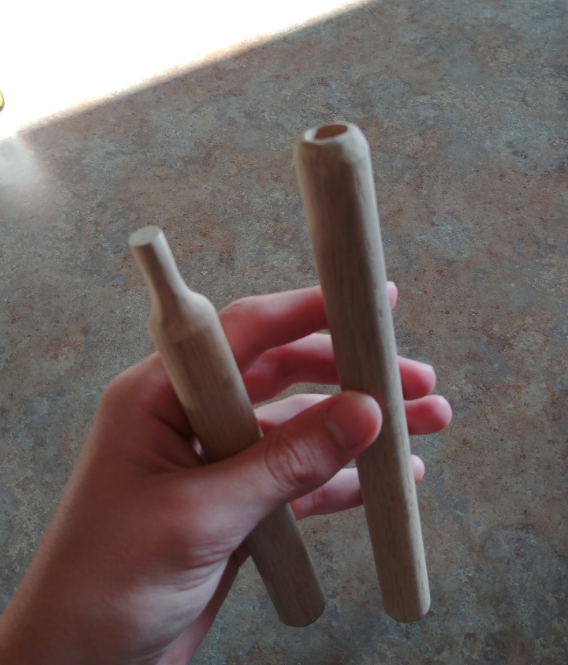 It was around this time that I almost gave up on sanding the dowel. I had been doing it for over an hour and it seemed like I had made very little progress. I took a break and continued on. After about another hour and a half, I was getting very close to finishing the spindle. 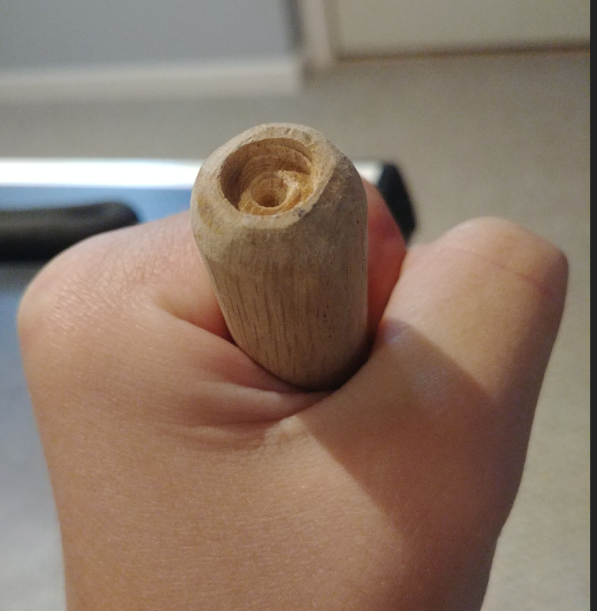 I continued sanding the spindle until the rammer fit nicely on it. I still have to cut off the spindle from the rest of the dowel and attach it to a base, but other then that, the tools are completed. I know that these tools aren't going to last nearly as long as metal tooling, but I still wanted to challenge myself with this project and I think they turned out looking pretty nice. 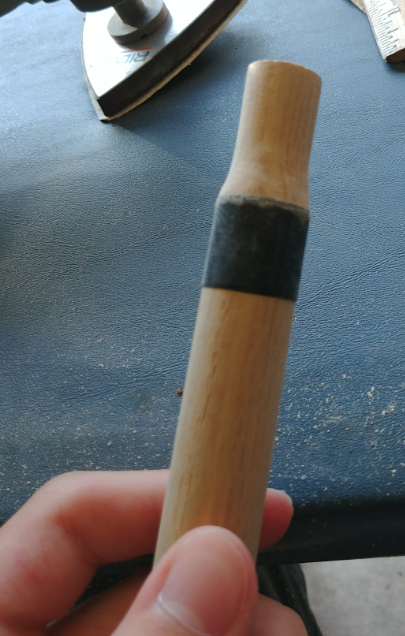 I will post pictures here once I completely finish the tools (attach the spindle to its base) and will show some pictures of the tools in use. In the end, these tools cost me a total of $3.05. Hopefully this will encourage anyone who wants to get into this hobby but is intimidated by the high prices of metal tools. It did take a lot of work, but in my opinion, it was worth it. Looks good! I would suggest soaking the tools in wood hardener to extend their durability. You should be able to find wood hardener at home depot/lowes. Thanks! I will look into getting some wood hardener. Mason, would his tooling work for a tied nozzle rocket or gerb? Looks like the tooling from westech. I'd also suggest wrapping the top of the rammer with filament tape. It'll help to slow the mushrooming and eventual cracking. I'm assuming since you're making hand made tooling out of wood, you don't plan to use a press. 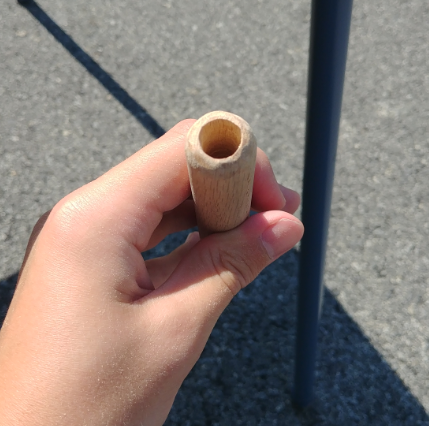 Wood tools work fairly well for small rockets. It's what I used last year, and rammed a handful successful rockets. Even a cheap one like this. Find an equally cheap vise for the press and you are done. With some ingenuity, you can even turn small wood dowels. Cool. Thanks for the suggestions, everyone. Yea I think it would, rolling tubes that way does take a bit of a knack, but wooden tools shouldn't make it any harder. Choked nozzles might be beneficial if using wooden drifts, because it eliminates the need for clay nozzles, which I suspect are pretty hard on wooden tools. Good job on the tooling, just about every young person looking to make rockets starts about the same way. I have a long history of sending tooling to beginners, free of charge. You can feel free to say no, that's OK, not everyone is comfortable with getting something for nothing but that really isn't the case. You see, we all start somewhere, we learn and master a certain aspect of a hobby and start to tweak the results. With wooden tooling, you will not be able to copy your results as the wood mushrooms and deforms. One good rocket followed by frustration. I would rather keep as many rocketeers around as I am able, we need more to join "the dark side", we have cookies! It's an all aluminum set, spindle attached to a base, a long rammer and a flat rammer. PM me if interested, again at no cost to you, just happy to help out. Edited by Maserface, 29 August 2018 - 03:15 PM. It's pretty much the cohete set, 2-1/2" spindle, can ram a nozzle or nozzleless. Works well with shredded r-candy fuel. To be clear, 3/4" ID? Edited by Maserface, 30 August 2018 - 09:06 AM. Thanks so much guys! I currently can't shoot rockets in my area because I am in the suburbs, but I may be moving soon so I will definitely consider it. Thanks again. I will get back to you. This might be out of line, I don't mean to swoop in looking for a handout, but as a "starving" college student working with a nail through a board with a lump of epoxy spindle and a dowel rammer I would be happy to give a loving home to some unused or unwanted tooling.